This actually started as practice for making starfields, following the tutorial by Greg Martin. Then, it grew into this. This is my first posted image created entirely in the computer, Shippou sketch and everything. Inuyasha copyright to Rumiko Takahashi, Shogakukan Inc., Sunrise, etc. 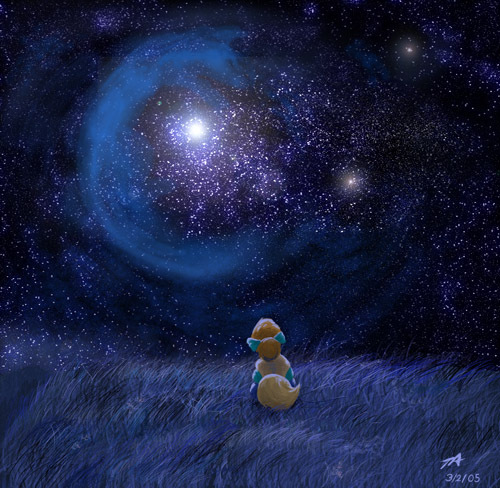 I did the background based around a tutorial on how to make starfields by an artist named Greg Martin. His website is http://www.artofgregmartin.com. He's recently redone his site, and the tutorials don't seem to be back up, but I'm hoping he'll repost them. At any rate, this picture started as just an exercise in creating a starfield following the tutorial. Then, I started working on the clouds and drew a fox-like shape, and the rest of the image just followed from there. Beautiful! n.n Hai, I agree with Kit -- they should of given a more in depth summary on Shippou's thoughts about his father's death. Love the way you did the stars and grass. n.n +favvidy!